Egg on their faces: Tokyopop's official YouTube channel played host to a copy of Mamoru Oshii's moody visual tone poem (and, it should be said, masterwork) Angel's Egg. For a while, anyway. After a rather baffled exchange on Twitter, it became clear Tokyopop did not in fact have the rights to the title, and was simply hosting a fansub under the excuse of wanting to "spread awareness" of the film. There's quite a difference between an enthusiastic fan who doesn't know better and a purportedly professional outfit. This has only confirmed my suspicions that Tokyopop remains, shall we say, unreconstructed in its approach to things. 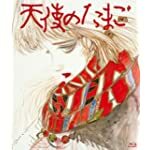 It would be nice if some kind soul could license Angel's Egg for distribution in English, but so far nobody seem to have been able to line up a deal. For the time being, there is a Blu-ray Disc edition available, albeit sans English. Beat this: From earlier, but still worth commenting on: The weirdness-burger that is the Western remake of Ghost in the Shell just added another patty. The production has signed its first Japanese actor to the cast, and it is none other than "Beat" Takeshi Kitano — and he's playing the head of Section 9, Daisuke Aramaki, the grand old man/eminence grise of the crew. Great news in the sense that Kitano is one of Japan's dramatic treasures, somewhere between Harvey Keitel and Jack Nicholson. (His earlier movies as director — Violent Cop in particular — are coming back out Stateside in new BD editions, and will be worth watching for.) But his inclusion also makes me all the more uneasy about all the other unquestioned assumptions about setting and race that have been bubbling to the top of this particular stew pot ever since they turned the heat on. The kid (still) stays in the picture: Another not-quite-news piece, but still interesting. The first pictures have surfaced for the new Astro-Boy TV series, and they promise something ... well, different from the franchise we've known. Another good example of how East and West's cultural influences on each other are cyclical: this one is far more in the Nicktoons mold than anything recognizably anime, but you can chalk at least some of that up to it being a three-way Japanese, French, and Monaco production. We're gonna build a wall: And climb over it.